Moda Designer Friendship blog hop. First of all, I want to thank you for spending time with us as we shared block patterns. I know you were anxious to read the designers posts and download blocks. Some of you ran in to some technical difficulties. patterns for you to download at the end of this post just to make sure. Second, I wanted to brag on the In-House team here. jumped in to “play” and share their color options for some of the blocks. the over achiever Tammy V. is back at it again. That makes 3 for Sarah! Not that any one is counting. If you are looking for fabrics to make your quilt, please check your local quilt store. Many shops are offering this project as a sampler quilt and have beautiful fabric combinations all planned for you. For the finishing and setting instructions, click here. traditional sashing and cornerstone option. I have included their patterns here. Just in case you didn’t get Jan’s, here it is. and her applique house addition. Another block and one more. And one more giveaway, mini charm pack sampler. An assortment of 30 different moda lines of fabric. Just tell us what you would do with these yummy tidbits of fabric in the comments. Now that you have all those quilt blocks, join us as some of our favorite people join us by sharing their favorite notions. Just imagine being stranded on an island, what notions would you not be able to live without? Check back to find out. They are yummy tid-bits. I would be in table runner heaven with them!! Love the mini charms, perhaps a postage stamp quilt! Loved this block blog hop! I would use most of those charm packs to make quilts using united notions charm Saturday pattern that uses 8 charm packs! What beautiful tidbits! So many things to make, so little time! How about…a lap quilt to stay warm. I have a very old and wonderful Bassett Hound named Rufus. He is going on 14, over 2 older than the average Bassett. But then Rufus isn’t an average anything. He’s kind, loyal and the best of friends. But most of all he encourages me everyday to go into my playroom. I think it is about time he gets a blanky to cover up with. So I will make my best friend a doggy quilt! Lovely paks….Probably make a postage stamp quilt! Also incorporate them in the projects I am already making. Have had fun in this hop. Thanks for sharing! Wow, such a lot of candy packs! I love making scrap quilts, so I would use them for a stack of scrappy lap quilts. And since I’ve only seen photos of many of these fabric lines, having the squares would help me to know which fabrics I need to hurry and buy yardage of! I think some kind of Irish Chain Quilt sounds fun! Thank you for hosting the Friendship Quilt Block collection, and for the extra patterns. If I were to win the mini charm packs, I’d be stitching up mini quilts I love from your Moda Candy booklet! Oh my goodness – think of all the quick charity quilts I could make with those mini charms! But first I would spread them all out on a bed for a week just to look at them – lovely! What a wonderful blog hop. Someday I hope to make all of these blocks! And with those mini charm packs – I think I would make pillow covers for lots of my friends, or little baby quilts! Thank you and all the designers for sharing their time creating these wonderful blocks. I seem to be missing 3 of them – 21, 26, and 27 and I can’t figure out where they are? What did I do wrong? I would take on a cathedral window quilt with mini charms. I have been wanting to try it for a while but I have not been brave enough. I will say that some of the blocks in this quilt along have pushed my skills and I’ve loved it! Thanks so much for a great 2 weeks of quilting. My first thought was postage stamp, but there are so many quilt patterns that could use these, like maybe a granny square! Thank you! If I were lucky enough to win them I’d make a scrappy trip around the world with them. They seem to be very popular with quilting bloggers and I like the looks of anything scrappy. Thanks for the chance to win and the blocks and finishing instructions. Cheers! I would use them all together and make a Moda postage stamp quilt. Oh my gosh–I LOVE the setting for the quilt!!! Now I REALLY, REALLY want to get to work on it!!! Awesome! I love the mini charms. Hmmm….after I looked at them all and looked again…I would probably make some quilts with them. Oh, hexies-I would work on some hexie projects with them! Truly enjoyed the blog hop, lots of blocks to make with great directions. I would use these mini charms to make charity quilts for our local NICU’s. This HAS been a really fun blog hop! I’d use the candies to make a lot of little quilts – one for each line, in 9 patches and Irish chains. Those small quilts go everywhere! Over the back of chairs, under lamps … under cats, too! Well as I don’t have any I would firstly just stroke them and if I was feeling really brave I would take them out of their wrappers and spread them all out on the floor!! Eventually I would get round to sewing with them!! Love the mini charm packs! I would make a small quilt or table runner. Thanks for the chance to win. Would love to put them together for charity quilts! The choices would be endless. I think a lot of them would be made into cute little Hexies for various table runners, purses and maybe a cute border around a lap sized quilt. Thanks for the chance to win. I have loved this blog hop and look forward to getting started on these blocks. Oh, such gorgeousness! I would make bunches of four-patches and see where they take me! Love the charm packs would make a baby quilt! Always need one of those! Thanks for the blog hop and friendship pattern! I have collected all but #26. Thank you to all your wonderful designers. What an amazing giveaway!! I would make a postage stamp quilt – probably with a solid square between every print. Thanks so much for the blog hop and all the fun and inspiration. I am looking forward to the next one! I’d mix some ranges together and make cute patchwork bags I think! Pillows, table toppers and bags oh my!!!! Love it! What a fantastic giveaway! For me it might be a really scrappy Irish Chain or even an enviable Postage Stamp Quilt! Thanks! So many ideas come to mind. I think I would start making nine patches and, then, perhaps a Mondo bag, or a baby quilt, or … Love those fabrics and I’ve thoroughly enjoyed the frienship block hop! Is there anyway to get a list of the designers and the block number they used? I seem to be missing four blocks–but was hoping for a list so I don’t have to run through all of the sites again….or perhaps you could tell me the names for: 20, 21, 26, 27 and 30. Thanks!!! I would make a fun picnic quilt. Thank you for the great hop! I’m baffled. I’m missing 21 & 26. Is anyone else missing them? I’ve went over them a second time and couldn’t find them. Your Friendship Blog Hop has been such fun..love all the blocks as well as the designers! Such talent! I would enjoy making a beautiful granny square quilt. Thank you for the opportunity to win the gorgeous fabric. A quilt of course. The fabric will be my inspiration. Thank you for this quilt-a-long. All of the designers have done a wonderful job for the Friendship Quilt. All of blocks have been collected and ready to make into the quilt. I could use the charms to coordinate with all of the blocks to make this MODA friendship quilt more special – for me. Thank you for the hard work and giving all of your followers a chance to win. A trip around the world quilt. This has been a fun quilt along. I’m saving the patterns for future use. I would love to win these mini charm packs. Thanks! I have an amazing 3-dimensional pinwheel pattern that I would make out of these cuties:) Had a blast – doing a quilt along with our local lqs – so much fun! I would love to make a quilt with them..maybe a 9 patch or a tumbler quilt. It would also be fun to make a yo yo quilt with them too. I think I’d make a Scrappy Trip Around quilt that is so popular on blogs right now. Thanks for the giveaway and blog hop! I have so enjoyed this blog hop. I used to be an avid quilter until I had to put that on hold as we cared for my father at home who had Alzheimer’s. After nearly 10 years I have just begun to piece again. The blog hop gave me great incentive and having a collection of Moda prints would be so exciting. Haven’t made up my mind exactly what I would piece with them, but they would surely be lovingly used on several quilts! 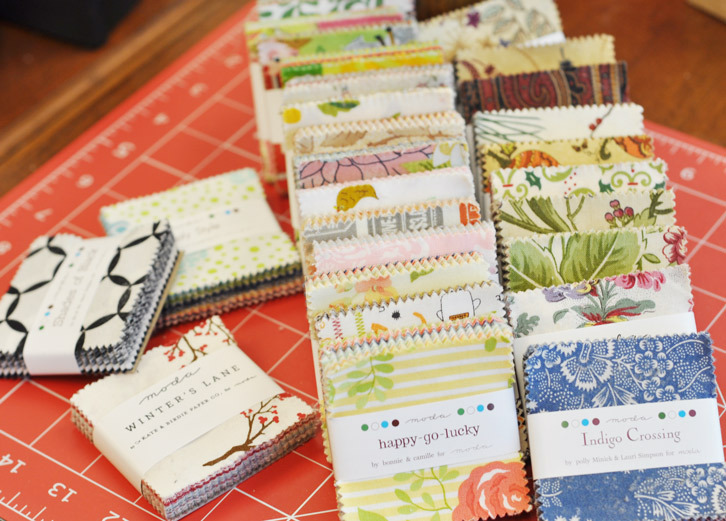 Packs with Moda fabrics…the possibilities are endless, but a scrappy style lap quilt would always work. Thanks for this friendship hop. Would mix them all up together, stitched them random together in a big quilt for on my own bed. Every night I would go to bed a half hour early and go and look at all the diferent fabric and fall a sleep with a big smile on my face. Because so many diferent fabric, so nearby that I can touch and feel it makes me very happy. So many possibilities! Quilts for my grandbabies, table runners for family, placemats, potholders — the ideas in my head are too numerous to count and to make (so much material, so little time! ), just limited by my ability to pair all these wonderful tidbits of beautiful fabrics! Love them all! I think I would use them to make my granddaughters mini quilts for their dolls! Thank you so much for the patterns and ideas. Table runners! Thanks for the rest of the links to the other blocks too! I am sooo into the hexagons right now. I would make a grandmothers flower garden wall hanging. A scrappy churn dash quilt is at the top of my “to do” list. These would be P-E-R-F-E-C-T!!! Thanks so much for the chance towin. I have really enjoyed the blog hop…and I love the mini charms. Would start on quilts for twin granddaughters. Thanks. So many ways to use them, but table runners came to mind first. I love changing my table settings and runners make it so easy. Thanks so much! I would make a baby blocks quilt for my new nephew, but probably in the process fall in love with most of the fabrics and have to buy yardage for my stash! 🙂 Thanks for the great blog hop! Thanks for such a fun blog hop! I am really into machine applique and would use the sampler packs for that. I am working on a quilt now that will have applique accents all around the border. As it is a scrappy quilt, I think a wide variety of fabrics would be fun to use in the applique! These are adorable! I can see the start of a beautiful Trip Around the World in those little bundles! Thank you for the chance This was great fun! I would have to admire these mini charms for a while. Eventually I would make a the most beautiful Granny Square quilt! Thanks for all the inspiration and beautiful fabrics. Thank you for the lovely giveaway. those minis are so cute. i would make a baby quilt, cause i just found out that a really good friend of me is expecting her first baby! Great Blocks and a wonderful cast of block designers I could not wait to sew what they had in store for a siggy block. So many fabrics to choose from for different projects! I would definitely use some as centers for my current Grandmother’s Flower Garden hexie–then use others for a mini hexie! Thanks for all the great block designs. I hope I have them all! OMG! I would love to win this amazing prize! I would use these to make a quilt with all of these wonderful friendship blocks! If I had anything left over I would definelty make a postage stamp quilt! Thanks for the awesome blog hop! I really enjoyed it! My favorite color is Moda! I would love to try the mini charm packs. I would get to work on some wall hangings and table toppers. Thanks for such a grest blog hop! I’d love to put all those little candies into table runners and wsll hangings! Fun, fun! Thanks again for all the great chances to win! A great blog hop! Love all the charm packs! What WOULD I do with them? Probably arrange them on our coffe table trunk and admire them for awhile…..eventually I would start making table runners and little quilts! I just looooove these little charm packs!! I would probably make a little postage stamp quilt! I have always wanted to try one of those! And the little charms would be perfect! Thanks for a great quilt along! So much fun!! Enjoyed the hop!! I would make mine into a hexagon runner or three!!! Oh, what a lovely giveaway. Postage Stamp, in my dreams, at least. Thanks for the chance. This hop has been such fun. Thank you. I would love to win these charm packs…..I would be in charm stash heaven….then I need to make a baby quilt for an expected grandchild. I’d love to win the charm packs. They would be perfect to use in my scrappy small quilts. what a wonderful prize! What would I do with them? I would start by using them to do all the projects I haven’t done from the Moda Candy Oh Sew Sweet hop. I’d then check out some options from the Moda Bake Shop. So much fun and inspiration from little squares of candy! Those mini s would be so fun for a start to my postage stamp quilt! Of course a postage stamp quilt, what else! Thanks to Moda and all of the designers for the wonderful blog hop!!! I had fun following along and collecting all of the patterns. I would love to win the mini charm packs and make a beautiful scrappy quilt! First I’d peruse each one and make a shopping list for full yardage and FQ stacks. Then I’d make some zipper pouchs to swap at the Fat Quarterly retreat in July. I would love to try a granny square quilt with them. Thanks for the chance. I would give some of them yo my guild sisters and we would make charity quilts out of them for seniors in our community. My Mom was a quilter. She pieced and quilted by hand and we never were able to share this together. The first quilt she ever made was a miniature quilt. She loved samplers. I would sew these little cuties into a sampler quilt in memory of my Mom. What a fun blog hop this has been. Thank you so much! Cute mini charms- I’m thinking table runners and table toppers, maybe some wall quilts. Oh the possibilities! Awesome Hop~! This was a lot of fun. I would make a postage stamp quilt with all those gorgeous minis. I’d save a few for Carrie Nelson’s Morsel pattern. Her pincushions are addictive! I would make a English paper pieced flower quilt, with them… Or a scrappy trip around the world. This is a fun blog hop, thank you! I`d love to play with them a make a big size quilt for me.Thanks for the fun!! I would make mini wall hangings, table runners and toppers! those cute little bits are begging to be stitched into a charm quilt. Thank you for the awesome and fun blog hop. Thank you also for your generosity with all the giveaways and pattern sharing. Moda has an amazing group of designers. Well… if I were to win the mini charm packs, I think that at first, I would just play with them… lay them all out and look at them… and then see what ideas pop into my head for how to use them. this was a great hop, I enjoyed collecting all the blocks. I’m not sure what I’d make with them, i’d use some of them in a sampler quilt I think. I would make a Scrap Vomit quilt by I’m a Ginger Monkey! With all the cutting done ahead what a great time saver! I made a Scappy Trip Around the World by Bonnie Hunter, now I’m “hooked” and can’t wait to try a different method. I would love to make a trip around the world quilt with the charm packs. Thank! Oh my, what fabulous giveaway! I don’t know exactly what I’d do with all those charm packs, but I know I’d have fun figuring it out!! I would love to make a postage stamp quilt out of these! I would make something like granny squares with my daughter who is nine…she loves to make things! I have loved doing the friendship hop! It’s been great! and the blocks are beautiful. Thank you! I did have fun looking at the designers blogs. Thank you for the Blocks and the layout. Collecting bits of candy charm packs is my new obsession. I love making 9 patches so that what I would with the fabric. I’ve really enjoyed this blog hop! If I were to win this giveaway, I’d make some of the Little Bite quilts from Miss Rosie’s quilt co. Love those! oooh – pretty! i would have to share with my mom and my quilting friend, but then i’d love to see an irish chain with some of those… wouldn’t that be fun? I have the perfect pattern with 4 patches and half square triangles. Thanks for the blog hop and giveaway. I would make some mini quilts/mug rugs for my coworkers! This was such a fun thing to do. I really enjoyed reading everyone’s blogs and collecting the squares. I would use the fabric to make a farmer’s wife quilt. I would use them in my Farmer’s Wife Quilt. They would be perfect!! What a lovely giveaway…I’d have to mix them all up into a postage stamp quilt! Thanks for the chance to win. oooh, I’d love a bunch of little pre-cut square to start a postage stamp quilt. I’ve wanted to do it for a long time, just need to sit down and get to it! thanks so much for the blog hop, the patterns are great and the fabric give a way! Just send me to the mysterious island with these charm packs and I would be in quilt paradise sewing up throws and tablerunners! I’ve been making mini quilts lately, and these mini bundles are just great for them. thanks for the giveaway. Thank you for the introductions to all of your designers and your generosity. The fabrics are all very beautiful. I have many ideas for projects to make with these fabrics. There are lots of choices to use the charm packs. I would use them for charity quilts or maybe rag quilts. Thanks for a chance for the giveaway. I love the new booklet from Moda with the patterns for those mini charm packs, I would make several of those with those charms. Love the Minis! So many placemats and coasters, they make wonderful gifts! And the table runners would be endless! What a wonderful giveaway. I have many ideas, such as table runner, table toppers, or perhaps another twister topper. Thanks for the chance to win. I love the little mini-charms! I would make a some little fabric baskets with them. I love your blog! I would love to win all those mini charms. Perhaps some mini quilts?? I would love to use them in a table runner or maybe wall hanging.Thank you for the chance to win and for the great Friendship Quilt Along. I am missing block 21 & 26. Can you post a link to these? Thanks!! I would start on these blocks. They are all so fun. What a great prize! I would add these into quilts for sure! What a great prize for someone! I have wanted to make some lap quilts for the people at the nursing home where my mother lives. I think I would use them for that purpose. Oooh, a postage stamp quilt!! A square Boston Commons quilt, with the center set on point – that would be a wonderfully scrappy and beautiful challenge for me! I loved this blog hop and enjoyed seeing all the designers blogs. Many I have added to my reader. I have downloaded all the patterns and now just need to pick out some fabric to get started. I am missing #21 & #26 also. For the assortment of Moda lines giveaway I would use some in small doll quilts for my daughter and maybe a snowball table topper for myself, or maybe a postage stamp quilt. Endless possibilities with beautiful bits of fabric. This has been great fun collecting all the block patterns. I just might tackle them all one day! I am not sure what I would do with the mini charms. They would be new to me but I expect I would find a pattern to use them in! I would make a quilt for my newlywed daughter and another for my son and his fiance! I would use the mini charms in things like placemats, table runners and tote bags. I enjoyed the blog hop. Thanks! First I would unwrap them all and throw them in the air:) What fun!!!! Hi! Thanks for this wonderful quilt along! I can’t wait to start! I would use your yummy mini charms as a starting point to start some of these gorgeous blocks in your quilt along! I was so excited to you included these extra patterns for us! Now to Quilt On! Oh goodness…what to make with all that fun fabric! little quilts, bags, maybe even a cute little skirt or two for our daughter that will be arriving soon. Those charm packs are beautiful! I would make a smallish postage stamp quilt for my daughter who is due in may 🙂 thanks for all the quilts fun these last two weeks! I would make some doll quilts and mini quilts to decorate my walls. Thank you so much for all the great creative quilters blocks and the chance at great fabric give aways. Use some for a Mondo-type tote! I could definitely see those turning into a few table runners! Or a hexagon quilt….or a postage stamp quilt….or a cute patchwork tote bag….so many ideas! I would make an assortment of Summer bags with some of the packs and incorporate some into quilts.Great gifts thank you for them and this Friendship Hop. I am missing 21&26 where did I go wrong. I am new to Quilting and would be over-the-moon if I were to win the incredible collection of mini-charms. I would use some to make baby quilts in the the Simple Chain pattern on the United Notions site or the Wiggly Whimsy quilt designed by Rebecca Silbaugh in the Moda BakeShop. And unlike pancakes – I would keep my first effort and give the second one improved by practice to the Linus Project. Wonderful fabrics and so many design possibilities! I think I would use them in my English paper pieced bowties that I am currently working on. Thanks for blog/block hop! I’d probably try a cathedral window quilt, too! I’m missing blocks 21 and 26. Did I miss them somewhere? Oh so lovely! I think I would use it for a Hexagon quilt. Thanks for the blog hop, Moda!! I enjoyed all the designer stops. Mini charms–great!! I’d been thinking how nice it would be to make the block using fabric by the designer and then thought,,,,no I’ll just use the fabric in my stash from each designer and improvise the rest. I like Lou’s comment on throwing them up in the air first! I would use them to make a postage stamp quilt or maybe a bunch of grocery bag holders. Thanks! I do have the Moda Candy Oh Sew Sweet, that would put a dent in the collection. Thankyou for the Friendship quilt, a great project to do. Love those mini charms! I think I would make a reverse Irish Chain quilt with them. Instead of squares on a white background it would be white squares on a scrappy pieced background. Thanks for the blog hop and the great giveaway. I would just keep stitching & trying new blocks & making more care quilts if I won these beautiful fabrics. I can think of TOO many things to do with them… a postage stamp quilt, a raw edge squares baby quilt, mix them with all the other pre-cuts I’m collecting 🙂 Thanks Moda! This has been so fun! I think I would make either a postage stamp quilt or something with small hexigons! Thanks for all the fun free block patterns, and the fun giveaway! If I won all those charm packs I would share with my quilting friends. Oh what to do…I think I would start tablerunners for Christmas presents. It’s never too early planning. I love those mini charm packs! If I won them I would share them with my quilt group and with my mom. I have enjoyed this Moda Friendship Quilt Along! Reading the designers blogs daily has been Sew much fun! Can’t wait to start making this quilt. I seem to be missing blocks 21 & 26. Thanks for the chance to win all those delicious mini charms. I would use them for a hexagon quilt! I’m fairly new to quilting–a hobby that has been passed down to me through many generations. So I’m excited to build a stash! And as I’ve been reading on blogs, someday I’d like to make a quilt for myself, but the joy of making them for others is so sweet. So the fabric would obviously go to gifts for others but nothing specific yet . . . just the start of many dreams! I’d put them together to make a quilt and/or table runner. I’ve LOVED this blog hop. I already got block 13, so need either 21 or 26 to make 30 blocks for this sampler. Winning would be like Christmas! I would love to use them in my Farmer’s Wife that I will be starting soon. Thanks for all the blocks and super give aways! Thanks for working so hard to make the blog hop so enjoyable! I would make a fun scrappy project. I bet there are packs for some of the wonderful moda fabrics I already have! I would combine each line with an approriate color solid and make HST with them. Then I would play to my hearts content arranging and rearranging the designs! I’ve been itching to make a Postage Stamp Quilt. I think these would be perfect for them– I’d use Primitive Gathering’s method of layering two squares to make two 9 patches. These are a perfect size to pair up and make half square triangles, some of which I’d put around the border perhaps of a charm pack sized half-square triangle design. The design could be a lovely square table topper or a new baby quilt for one of my ‘new’ grandchildren in the future (!! ), or even one for one of my 3 little grandsons to cover their teddies! Thanks for this chance. Loved the hop and all their blogs. I would make a drop dead gorgeous postage stamp quilt with those yummies! I would love to do Cathedral Window Quilt. Thank you for this great QAL! I think a charm quilt would be perfect! As always, thanks for a great blog hop. Love minis! I would use them to make miniature quilts for the kids and for wall decor! I’ve really enjoyed following the friendship hop. For some reason, I don’t seem to have Blocks #21, 24, & 26. I even went back over the entries and I’m still befuddled! Can you give me the website addresses of those blogs who had these blocks and I’ll go back and download them. Sorry – I just can’t figure it out. all the giveaways and patterns. I’m thinking a charm quilt would be the perfect use for these minis. Thanks for the hop. Oh what fun could be had with these minis! A trip around the world quilt would be a great project for these. Thanks for the great “friendship” hop. It was so much fun to see all of the blocks and to meet the designers. Found some new blogs to follow. What would I make with this wonderful gift? I would make them into table toppers for gifts. First off thanks for all the hard work of putting this together for us. It has been a fun trip .. as for the mini’s I am wanting to do a basket quilt and these would be perfect. Wouldn’t it make some beautiful scrappy trips around the world blocks. I am learning to make feathered stars and think these would be perfect for the ‘feathers’! It would be oh! so scrappy and oh! so pretty! I could definitely use those little squares in my cathedral window quilt that I have been working on. This has been so much fun, thank you for the chance to win such a great assortment of charms! I think a quilt using all of them to make a true charm quilt would be fun. I love the idea of a true old fashioned scrap charm quilt where no two fabrics are the same… Except one hidden pair somwhere. Mmmmmm – I would probably mix them with some yummy neutrals and use them to make a quilt. Thanks so much for the patterns and all the giveaways! It is so much fun to learn about the moda designers and hear their stories! Yummy! I would make a lovely pile of hexagons. I would love to have these mini charm packs. I have a couple already and would like to add to them so I can make a quilt. Placemats or mini quilts so much fun! On my list of projects that I want to do someday is a postage stamp quilt. These would be perfect! Oh so YUMMY! Gosh how I love your fabric. My sister’s-in-law are all having their first babies. I would use the tid-bits to make a few happy baby quilts. 🙂 Thank you for the giveaway! Right now, I’m big into experimenting with combining several collections so I’d use the charm packs to blend new looks. There are a number of patterns specific to charm packs that I’d love to try! I see so many scrappy quilts I like but I don’t have many scraps so I’d use them to make a scrappy quilt. I would use the mini charm packs to make doll quilts. I have found that even little boys like small quilts if they are made out “guy fabric” ! Thanks for the giveaway and all the wonderful blocks! I love your blog hops and all the posts from the designers – so inspiring! I would take 11 of them–name a colour to be a background fabric–distribute them to retreat buddies and say “in the next 10 months–make a smile quilt to go to the Grand River Cancer centre–bring it for show and tell to our retreat in november”—There is so much to be said for the comfort a quilt brings to a person who is in treatment. I know my quilt girl friends would love this!! Oh wow, that is GOLD to me! I’m a simple square patchwork kind of girl, I would be in Heaven making quilts! With 5 granddaughters who want me to make them purses, I would totally go crazy making purses with those yummy charms! I have four daughters who all love American Girl dolls. I would use these to make them each a doll quilt! What fun!They are perfect for half square triangles paired with a yet to be decided Bella. Thanks for engineering the Quilt Along and offering the patterns and free fabrics. I love to make mini quilts and these mini charms would be perfect for my projects. What a collection of wonderful fabrics! I would make a quilt just using the square as they are, maybe cutting some in half diagonally to make a block. This has been so much fun. I’m looking forward to the next Moda Block Blog fun. I have never been able to use any bake shop products, as they sell out before I can get my hands on them. Currently there are several lines I wouldlike to have “a little bit ” of, as I want to make a quilt to commemorate my daughters college graduation next month with an english degree. All the “wordy”lines would be PERFECT! Well, first I would go on a fabric shopping spree! Need something to go with them, right? Any excuse to buy fabric! I would make pillows and table toppers. Or maybe a nice scrappy quilt. Boy would I have fun! I think a table runner would be fun! My table needs brightening up! I am stitching my way through several “charm” quilt books and these would be perfect! I have loved this friendship block hop! Thank you so much. Could you also post block 30? I had trouble downloading it. WOW! All the blocks are lovely and the mini charms are yummy. I would use them to make doll quilts for my granddaughters, how fun that would be!! I’d make a scrappy quilt! I have been making mug rugs lately. I think the mini charms would be great for those! This has been a really wonderful blog hop. Thank you so much. My bedroom is in need of a brighten up so with such a wonderful prize I would make myself a stack of throw cushions to create a relaxing and inspiring space for myself. If I won those charm packs, I would first night, line them up on one side of my bed and sleep with them-lol -really! This has been so much fun and I have a few more blogs to follow! Thank-you. You are a great company and I love pre-cuts. A scrappy Irish chain or just a scrappy quilt or any kind with so much fabric to choose from. Thanks for the great block patterns and the give-aways. What a fabulous give-away! First, I would lay them all out and just look at them. So much beauty! Then I would carefully select projects – perhaps some new pillows for the living room, a new bag, and my wonderful fur purrrrson, Monroe, would get a new little quilt of his own! He LOVES to lay on whatever I’m working on. I have all the patterns from your previous blog hop for the Sew Sweet Sampler. Thats what I would use the mini charm packs for. These lovelies would make scrappy quilt. I’ve always wanted to do one! Oh, my!! I have 4 granddaughters who are always needing something for their dolls…so they would be turned into doll quilts or clothes and ant leftovers would be mine to make something scrappy. I have so enjoyed this blog hop! Thirty lines of fabric…you guys are the best. First, MUST look at them, then really look at the fabric and play. I envision adding a fabric and doing a nine patch, Irish chain, or a postage stamp…what fun. This has been the best! I have had fun checking the different blogs, answering the questions, reading others peoples comments, printing all these wonderful patterns, and checking out the designers fabrics. Thank you! Oh my goodness, how I would love to win these! They would be perfect for me to try out the patterns from my Moda Candy Projects Booklet that I recently acquired. If I won them I’d have to sew them all together to make a quilt. 2″ finished charm square quilt. I’d love to win! I’d make mini-quilts, totes and potholders, oh my! Thanks for the chance to win! I would use them to make scrappy borders and sashing for solid blocks for a very unique “reverse” quilt. Thanks so much for the Friendship Quilt Along with the blocks and setting instructions. I would use the charms in the Friendship Quilt and make some items from Moda’s Candy Oh So Sweet pattern book…especially the table runner from p. 33.
oohhh… I love moda charm candy, so many possibilities, my friend and major work dog the rotary cutter will be especially excited because that means that any project I do make he will get a break. Thanks so much for the great blog hop. I love hexagons so another quilt could be made. And I have a granddaughter just starting the quilting process so perfect little gift for her. You picked great designers for this. If I had these mini charm packs I’d attach some awesome magic corners to some Bella solid squares to make a beautiful quilt for my granddaughter. I love hexagons so some of the fabric would go towards that. And I have a granddaughter starting to quilt so perfect little present for her. Great job with the designers picked for this project. I could easily make a table runner, a purse, a large tote for taking my quilts to show and share at guild meetings. Oooo, lovely. I’d be making hexies from them. Thanks for the chance. I’m missing 21 and 26 as well. Thanks for this great quiltalong! Love all the different patterns that have been shared! What would I do with 30 different mini charm packs? I have a pattern for a quilt I have wanted to make for years. The first instruction is “Cut out 144 different 2 1/2 inch squares.” Perfect. The mini charm packs are just perfect. I’m not sure what I would do…besides petting them and loving them, they are so cute! Disappearing 9 patch. I need to make a baby quilt and I have so many placement ideas, this sampler would be perfect. I already entered once but had a question. I’m missing blocks 21 and 26. Could you email me the links. I went back thru all the designers and can’t find them. I must have missed something. Thank you. This has been fun. For the mini charms, I would make a mini churn dash scrappy quilt or try a mini hexagon patchwork. All those little charms?? I don’t know if I could use them. They are such perfect little bundles of sweetness! If I did, I would just do a large quilt with them, all mixed like a postage stamp style. Just play and sew! The blog hop was fun. Thanks! What wonderful yummy little packs! I would have to let my two granddaughters ages 7 & 9 pick out some and let them make their next little quilt. No cutting for them, just sewing. I would love to win the mini charms. I would make a scrappy granny square quilt. Thanks for hosting the quilt-along! It was a fun quilt along. I have saved the blocks and I love the setting directions. I would make a quilt if I were to win those cuties. I want to make a postage stamp quilt someday! I would use these yummy tidbits for that! Would use the mini charms in my hexagon charm quilt. Wow, I am sure a few of those packs would be used for table runners but I also need a dish mat to put glasses on so that would be another project. And I am thinking I might make an outfit for my 1 yr old Granddaughter using them. Those smaller squares would make a super cute patchwork type outfit instead of using larger squares. I’m also thinking ahead to making Christmas presents like more table runners, totes or purses, placemats or whatever else I could come up with. Of course, first I’ll have to spread them out so I can drool awhile at their beauty. After spreading the mini charms out and just looking at the eye candy for a while I would probably make a tote bag or scrappy lap quilt for myself. I have loved the mini charm packs ever since they first came out. To win 30 of them would be awesome. I love working with half-square triangle blocks in my quilts. I just finished making the Charmalade quilt from Moda Bake Shop using Marmalade charm squares. It looks so pretty – love the colors. I planning on making this same pattern with mini charms for a scrappy quilt. I think it would look really cool. Thanks for all the fun. It was great. Oh, I wouldn’t be w/out LOTS of scraps, good scissors, good light and lots of needles and thread. Oh, would there be electricity on that island? Could I bring my sewing machine. Oh the time – that’s what I would really love. Uninterupted time to quilt, quilt quilt! I’m thinking I might go a little granny square crazy…just maybe (but only after I stacked them all up and stared at them for awhile! I have a great baby quilt pattern than uses mini charm sized squares so I would make some of those to donate to our children’s hospital. What a great giveaway! I would probably make a gorgeous display with all those tiny little charm packs before I actually made something….then I am thinking maybe a scrappy irish chain…. What fun it would be to do a postage stamp quilt with all those yummy prints and colors.. I love the mini charms and buy them all the time! I make ‘small quilts’ with them or miniatures. Wonderful to have a chance to win, thanks! Oooh, I love the mini-charms! I’d do either a postage stamp quilt or a hexagon quilt with them. Oh I would be in heaven if I won. I would make a postage stamp quilt. I’d totally make a patchwork purse!! Thanks for the fun blog hop!! I had a great time visiting all the designers!! I would use my tiniest twister ruller and make a quilt for my newest great granddaughter. I would probably just look at them for awhile. There are so many beautiful fabrics to stack, rearrange, take to the store to buy larger pieces…:) Then I would start sewing. oooh! I think I’d love to make a scrappy postage stamp quilt with them! They’d look fantastic together. Does anyone know where i can find the patterns for Blocks #21 adn #26? I couldn’t find them anywhere. Thanks! I have to decide what to make??? I can’t just stash??? But seriously, I would love to use them in a hexie and applique style quilt, or maybe a postage stamp. Thanks for the great quiltalong and giveaways. Those little packs would help fill out my collection for a postage stamp quilt! This has been lots of fun!! Never tried tid-bits… would be interesting and fun! I’d make a table runner and maybe some placemats to match! I was just looking at a pattern that calls for an assortment of 2.5 squares. These would be perfect! on the blog Wedding Dress Blue There is a pattern called “Film at Five” that would work perfectly with those charms. So many ideas to choose from! Placemat? Lap quilt? Baby quilts? Or just spread them out and admire them until inspiration struck. Thanks for the giveaway, love all things Moda! Oh to have so many little 2 1/2 squares. I make half square triangles to make a nice scrappy quilt. Thanks this was a lot of fun, I do hope you do this again!!!! If I won those great charm packs, I could make all of Carrie’s Little Bites. It would be such fun! Oh, I would make baby quilts and bags for my kids. 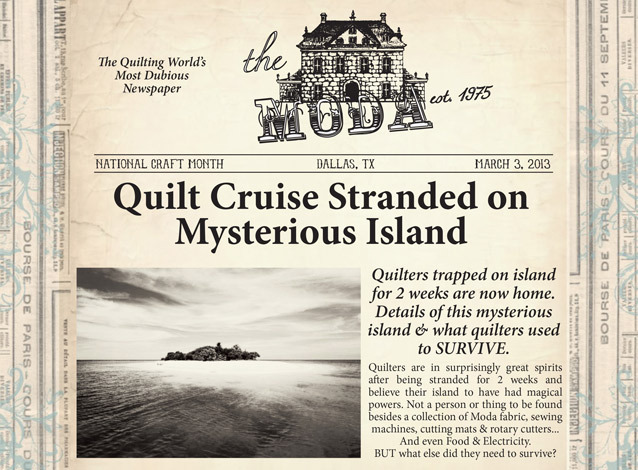 First…Thank you so much for the Moda Friendship Quilt along and to all the designers~! I just love it when you offer this. I love Moda fabric and will be a fan for life. I would make a wall hanging for my kitchen. I see a postage stamp quilt out of them — or a couple smaller ones if they don’t all go well together. Thank you for a fun quilt-along. I have about 1/3 of the blocks cut out so far. I wasn’t able to keep up, but I have all the block patterns. Again, thank you! It has been fun! I’d make a quilt for my daughter from these yummy tidbits. I’d like to try a star pattern like Lissa Alexander’s block. I think they would make a great scrappy trip quilt. All those different colors/prints. Thanks for a “great” hop, it was alot of fun. My 6 year old grand daughter loves my quilt projects. I decided that it was time to start teaching her the basics of quilting. We decided that our first project would be a quilt for her doll babies. That is how I would use the charm packs. Mini charm packs are my favorite size for making pillows & table toppers, so that’s what i would be making!! This has been so fun ! I can’t wait to start my quilt…still working on choosing fabrics. If I won your giveaway I’d make some mini quilts and table runners. Thanks for the Friendship Quilt-Along !! I’d take a “trip around the world” with all those little charms! I think a scrappy quilt would be lovely with all these mini charms. Wow! The joy of winning these. First I would grab a cup of coffee and sit down on the floor in my quilting room and spread them out all around me. Next I would admire them all and place them in groups trying to decide what project I would use them in. Last I would call my best quilting buddy and have her join me and share the wonderful gift with her. ThabNks Moda for a great block of the day program. I would combine several of the mini charm packs and make some darling scrappy quilts–maybe just 4 or 9 patches, with a background fabric. I’d take the Binding Tool! Love this Quilt Along! Definitely gonna try some of these blocks! My 4 year old is really getting into sewing so I would share them with her and of course I’d love to play them into a quilt. Thanks for the chance! I would love to make a bag out of them! Thanks for the chance to win. I would put them in a Dear Jane quilt. I just love the blog hop and meeting so many new sites to go back and read and have fun. Thank you for all the patterns and it will make a wonderful scrap quilt for myself. The little squares would make a wonderful baby quilt, a great table runner, small bag, so many ideas to play with. Thanks for a great five away. Thanks for the chance at the great giveaway!! I would use these lovely mini-charms to make several of Miss Rosie’s “Little Bites” patterns; they are addicting little projects. I would use them in a Farmer’s Wife scrappy quilt. Thanks for all of the block patterns! After I admired and fondled the mini charm pack samplers, I’s make new table runners for myself and my daughters. Thanks for the HOP it was fun, some great blocks. Thanks for the giveaway also. Thanks for posting links to the missing blocks!! I’d make and donate Itty bitty quilts or doll quilts for little girls however, Happy go lucky and Glamping is all mine! Oh,I love these little charms, making a wall hanging right now with some and have a couple of table runners in mind that would be perfect. Thanks. These would be perfect for ‘Abbys Treasure Box’ bag pattern, table runner, mini quilt – the list is endless! My favorite thing to do is baby quilts, but if not the right fabric, then perhaps a small wall hanging or table runner. So many possibilities with those mini charms! I’d make a few table toppers, a patchwork purse or two and some granny square blocks! The possibilities are endless! So many ideas are running through my head!! My biggest problem would choosing what project to do first! What fun! I think I would make some mini quilts with my thimble template. I could also make mini nine-patch blocks. Oh, so much fun!! The possibilities are endless, but I’m thinking some mini quilts or a scrappy trip around the world. It would be fun deciding! I would love them, look at each one individually, then give them a good home in a lovely quilt, where they would play together nicely ever after. Ack! Those would be so fun to play with! I’m thinking dolly quilts or some other small quilts… super fun! Great blog hop. I’d make a postage stamp quilt – thanks for the giveaway. Woo…hooo…think I would make a scrappy chain kind of quilt! Thanks so much for all the fun! I love mini charm packs because they are nice to use as the background patchwork piece for an applique project. That makes a nice wall hanging and that’s what I want to use them for should I win. I would either use them in a scrappy quilt or make hexies out of them and have a scrappy hexie quilt. I’d sew a new bag and look for apattern in these creative blogs! I would use the minis to work on a postage stamp quilt…….can you just imagine?????? I would make a ton of mini-quilts! Oooh, Lovely. Scrappy Baby quilts and table runners. And, I’d love to mix and match lines. Wow! I’d use them, mixed with Bella solids, in a lap quilt for my couch along with some pillows. After I played with them for awhile, I would use the mini charm packs to make a much larger version of Miss Rosie’s Speck quilt pattern. I think I would use them in a Cathedral Window. I made one for a baby quilt and I really loved it. This time I want to make a king size quilt and these candy packs would be a great start. Thanks for the chance to win. I made a Cathedral Window baby quilt and I would use these squares to make a king sized one for my bed. Thanks for the chance to win. I would make an adorable little quilt! Thanks for the extra patterns and the giveaway! I would make a scrappy charm quilt with the ‘yummy tidbits’! What fun! Thank you for the friendship fun….I enjoyed all the blogs and have made a ‘wish list’ a mile long! I am thinking I would make a color study quilt. SInce it is best to see fabrics with your own eyes to fully appreciate the beauty of the patterns and colors, I would use the tidbits to help me choose which fabrics to purchase more of for future projects. They could be used for potholders, fabric belts, totes, be cut with my Slice for appliqué onto t-shirts, I could go on and on. Thank you for the blocks and setting pattern. I enjoyed getting to know the fabric designers by going to their blogs. I have a church pew that I use for seasonal decorations. I would sew the mini charm pack fabric(lights with darks or mediums)into half square triangles and use them for little pillows or borders & backs for cross stitch ornaments. Oh, I’ve wanted some of these for so long. Want to work on combining different designers fabrics and making some smaller projects. Thank you for this wonderful quilt along. My printer got a real workout and I’m ready to get sewing. I would say I could see a postage stamp quilt in the near future!! I LOVE mini charm packs !!!! Sooo many posibilities. I would probably work on some nice big patchwork pillows. I recently moved from my quilting friends and would love to send them each a pack or two to know that I am still connected to them! Love to share. I think I would make some great little patchwork Easter baskets to fill for my daughter who works in a children’s icu floor. I have recently moved away from my quilting friends and support. I would love to send them a pack or two to let them know we can still “swap” fabric ;o) Love to share. I love small quilts and would be in small quilt heaven with an abundance of small fabrics to select from. Winning would be like Christmas and my birthday rolled into one. Enjoyed this blog hop. I love mug rugs!! I would make a ton and give them away. I would make a granny square quilt and hand stitch the squares together. Thanks for the giveaway! I would love to make some 16 patches for a quilt for my nephew. Working on table runners for every season! These would be divine! This has been such a fun block party! I really like some of the blocks, and I enjoy making sampler quilts, so this is just up my alley. What would I do with all the goodies? I’ve always wanted to try some of the patterns that are for precuts, and this would be just the way to try! I would make a special great granddaughter a doll quilt, thanks for the giveaway chance.. I think I would have to make some of the Little Bites quilt patterns. They are just adorable! I am also missing block numbers 21 and 26. Thank you for the chance to win. I think it would be fun to make a crib quilt for my friend’s almost here 1st grandson. Thanks for a chance to win. I would make a charm quilt as I have been collecting 2.5 inch squares for a few months to do just that! Thank you so much for the wonderful Blog Hop. I had lots of fun! If I could win the mini charms, a table runner, or lap quilt. these would make a fun postage stamp quilt! all those different lines mixed together. I am so in love with mini charms! I joined Fat Quarter Shops’ mini charm pack club and am challenging myself to use a different pattern for each pack. But I would be THRILLED to win some! Thanks for the great giveaway. First I would just look at them and admire them, then I would have to fondle them because sometimes that’s as much fun as making something with them. I would love to win these beautiful mini charms packs. I loved the sew along. Thanks so much! I see a lot of mini or doll quilts when I look at that picture of charms. What fun it would be to try to put several collections into one quilt. I think I’d make some baby quilts and pouches. Something small and manageable for once! Thank you for the contest and the wonderful selection of blocks .If I was lucky enough to receive these mini charms I would make all the bags I could. Well I would have to make my second quilt!!! So pretty! Trying to decide what to make for a friend having twins in July. These would be perfect! Where do I begin??? Table runners, placemats, doll quilts, pillows… Let me get started! Thanks for all the blocks! I plan to make a table runner using block 18–love it! I’m all about scrappy quilts, so after I pet the mini charms for a couple weeks (maybe months) I would use them in a mini tumbler quilt–it’s on my bucket list! I’m thinking a scrappy trip around the world. Thank you for the chance to win! I’m sure I’d fondle them for a while when I first open the package. Then I’d display them on a shelf in my sewing room & admire them for a while. Then, I’d agonize over how to use them and spend many hours pouring over books, magazines and the internet trying to find just the right project. Eventually I’d put them in a quilt, of course. Thanks! I’ve been wanting to start a Trip around the world quilt. These would work great!!! I see a scrappy hexagon or pinwheel quilt in the making. Not sure where to start with all these goodies, but I do love hand appliqué and small pieces are perfect for that! The mini charm packs would be perfect for a postage stamp quilt! I have always wanted to make a postage stamp quilt, and these charms would be perfect!! Thanks so much for the very fun blog hop. I might use them to make some slightly over-sized granny square blocks for a quilt. Or over-sized trip-around-the-world blocks. So many choice. Many thanks! I can see hundreds of half square triangles – what a charmer that would be. I love these tiny charm packs…I’m quite addicted to them! They are just a great way to enjoy so many different fabric lines. I would certainly make quite a few beautiful little quilts if I were to win. Thank you for offering such a great chance! Oh, my this is small block heaven for me! A solid grey or beige and these would make a beautiful scrappy quilt. table runners and purselets for me. I have granddaughters in need of doll quilts. Those mini charm packs look like just what I need. Oh what fun! I would make a wall hanging with lots of timy triangles! Thank you so much for the blog hop. I enjoyed getting to know the Moda designers! Opps! Forgot to mention what I would make if I won … that would be HST “postage” stamp type quilt … something with intricately designed blocks! What fun!!! I would make doll quilts for my daughter with the mini charms. I really love the idea of making mini versions of full size quilts. Another great challenge would be to incorporate all of the Moda mini charms into one cohesive quilt. Thanks for the chance to win and I love all of the blocks and can’t wait to start assembling the quilt top soon. I would hold a “Candy Land” month on my blog and keep making mini quilts until they were all gone. Deliciousness! Fun pillows for my daughter’s bedrooms and table runners and mug rugs! I don’t even know where I’d begin to use these! Probably on a scrappy baby quilt for some close friends. Thanks for hosting a great series with wonderful giveaways throughout! As a new quilter, this was a great way to “get my feet” and see a wide variety of the fabric selections you have as well as the infinite possibilities for quilting. A little overwhelming for a newbie, but a great inspiration! I can’t wait to get more projects going now!! I would make some pillows for the sofa. I love mini charm packs! I’ve already used them in borders (straight and on point), and I’ve got a few patterns for quilt tops just waiting for 2 1/2″ squares. Thanks for including Jan Patek’s block and little house applique! I love to use mini charms for English paper piecing! Thanks so much for this wonderful Friendship Quilt Along! I’m new to quilting, partway through my first quilt, so I’m drooling over all the possibilities those lovely packs offer! Delish! Probably a baby quilt- so many babies on the way! Wall hangings & table runners would be made!!!! Candy, candy, candy!! I love these mini charm packs. I would make a quilt for a very nice young man at work whose wife is expecting a baby. He’s so nice and helpful to me that I want to do something special for him. I have really enjoyed this Friendship Blog Hop. Thank you for all the patterns and a great time!! I’m seeing a whole mess of awesome granny squares! Pillows, mugrugs, potholders and of course a big ol’ quilt for me! Thanks for the chance to win! Oh my! What couldn’t I make with these sweet little tidbits?! Thanks for everything, Moda! I love you! I would make miniature quilts. I am creating a wall of quilt art. Thanks for all the block patterns! Oh, What FUN! So many ideas floating about in my head. I have 9 grand-kids, and another on the way. I’m behind in getting each one a special quilt. I think I’d have a very fun summer:) getting caught up. I’ve so enjoyed these quilt blocks. I admire the creativity. Thanks! These blocks are all wonderful! thank you!! I would make a mini table topper if I won a mini charm pack! Thanks for the chance! Loving the mini charm packs. I have something very modern in mind. And I love your newspaper. I would love to be stranded there. i would put my Miss Rosie Little Bites patters to good use – oooo!!! And I would wrestle the Little Bites patterns away from her, and start making my OWN good stuff!!! What couldn’t you do with an assortment like this :). Thanks for the QA – looking forward to trying the blocks when I have a little more time (and my sewing machine is back from repair. I think I’d make a yummy kids quilt. thanks for the chance. Thanks for the Quilt Along! I really enjoyed the quilt blocks and reading all of the designer blogs! I would love to make table runners or table mats with the mini charm packs. I am itching to make , either ( or both) , granny squares or a trip around the world! So therefore I will be needing many many mini charms! Loved your blog hop, did not make the blocks yet as I am working on a UFO, and promised myself to only leave it, when it’s done…. Almost there. Thanks or the chance. I would love to win these little “teasers”. I would probably make a charm sampler quilt. I am so excited to try making some of these blocks. Oh wow…a postage stamp quilt and all the cutting is already done! A scrappy nine-patch quilt would be a fun thing to make with the mini charms. Thanks for the chance to win. Hop has been a blast…thank you! The Little Bites Chip pattern is the way to go ……can you just see the glorious stars that would be made with all those wonderful mini’s!!!! Thanks for all the great blocks ! i would use these paks to make them ! This has been a lot of fun, thanks for hosting! I’ve been thinking of table covers for a while, so that’s what I’d do with mini charm packs. 30 little charm packs…pick me!!! They would be so much fun to use the ones I want and then share the rest of them with my quilting sisters Bet we could do some really neat charity quilts with them and more of our stash…or buy fabric to go with it. Thanks for the blog hop. It was fun. I would gather my quilting friends and we would do a quilting challenge with the charms. What fun! Hmmm. I think I would make doll quilts for my 3 little nieces and then some coordinating pouches for their mommies if there are enough charms left. What an amazingly wonderful prize. My 2 1/2 year-old granddaughter is fascinated with fabric and sewing, and adores precuts. These mini charms would be fun to use for tabletoppers and make-up bags as well as making doll quilts with my granddaughter. And she’ll have loads of fun playing with them, too. Oh my….thats alot of beautiful mini charms! I would love to make a scrappy hexagon quilt. Thank you for all the wonderful block patterns and giveaway! with all those beautiful charm packs I would just cuddle and love them for awhile, and then I’d make a tumbler quilt, some quilted tote bags, table runners, place mats, hot pads, purse accessories, and a lap quilt. I think I would use them making Hexagons. I’d LOVE to add these charm packs to the four packs that I already own and make my first Granny square quilt! My Granny will be 90 in February next year and I’d really like to make her a special quilt. I know she would love it!!! I would pair all those beautiful little squares with white fabric… Half square triangles galore … And then take advantage of the white to create a pattern of my own! It might not come out as an original as we are all influenced by our books, magazines, and websites … But whatever I would come up with would be hard for anyone else to replicate, so original enough! I love the mini charms! I use them for making hexagons! I would add them to some other charm squares I have and make a disappearing nine patch. Thanks for the chance to win and putting this Friendship Hop together for us, it has been a lot of fun! How wonderful it’d be to use the mini charm packs to make little wall quilts. I’ve always dreamed of several little/mini quilts all on one wall in our home. Wow ~ this is an awesome giveaway! What a wonderful thing it would be to experience so many yummy Moda fabrics! ☺ I’d love to share these with my oh so sweet granddaughter. ♥ She could make her very own postage stamp quilt. Wouldn’t we have fun, fun, fun! Thanks for the chance to win! I’d love these for a granny square quilt. What gorgeous fabrics! Scrappy quilts are my favorite so I’d make a wonderful scrappy quilt out of all these mini squares! Would love to take them on a cruise, and hopefully get stranded on a lovely island….. Thank you for this lovely project. With this mini charm packs, perhaps a doll quilt. Good week end. I’m new to quilting. Does not have as many different fabrics that fit together. If I am lucky enough to win them. I will use them to learn how to make some of all the blocks I have collected and put them together for pillows, table runners, bags and quilts. I would love to win these mini charm packs. Thank you! I would make a charm quilt with the fabrics. I would sit down with granddaughters age 5 & 8 and have them arrange the squares anyway they want to make 2 doll quilts. Then I’d sew them together. I think I would playy with the colors and values and make a charm square quilt. With each charme pack making up a block. This chrm pack will fit perfectly for a border of a baby quilt! Love it! A postage stamp quilt! The hop was fun fun fun! thank you! I’d probably stroke them and pat them for quite a while! I’d like to make some of Miss Rosie’s Little Bites patterns. These would be a great addition to birthday gift baskets for my quilting friends! I’ve wanted to do a postage stamp quilt for years; these would fill that bill. I would use them to get started on my Christmas presents! This year everyone is getting a pillow. I’d also use some of them to make skirts for my granddaughters. Since this is the Moda Friendship Quilt Along, I would use those yummy baby charms as little surprises for friends. For birthdays, for pick-me-ups, for a little sweet surprise, celebrating our friendship. Thanks for hosting a great QAL! You mean other than squeal with joy and then arrange them in colour order?? Hmm… A rainbow granny squares? I’ve got a cute beach bag pattern that I’m dying to make. Summer will be here before you know it! OMG it would be amazing to win!!! In would use them to make a friendship sampler quilt wall hanging for my sewing room. I would use them to make hexies and from there a quilt and pillow. It was a blast participating in your blog hop. Thanks!!! I love to do scrap quilts and the fabric packs are so easy to use. Love them!!! The variety of fabrics can not be beat. I would make a baby quilt. There are so many possibilities with charm packs. Thanks for including me in this very generous giveaway. I like the mini charm packs, tey ae perfect for making hexies! And you so generously had downloads of the mini charm projects from your booklet – I would try a few of those as well. What an awesome prize!!! I somehow missed block 20. Can anyone tell me where it is? I have 2 ideas. One is to make hexies with them to mix with the hexie precuts coming out. The other is to make beads of a necklace…they are stuffed mini yo-yos. Thanks for the chance to win. Oh, how cute! I’d make a table runner, hot pads, and all sorts of things! thank you for all the beautiful block patterns. Somehow I missed Block 4, 19 and 20. Could you please tell me where I can find them? I saw a pattern for a scrappy quilt using 2 1/2 inch squares on Pat Sloan’s blog while I was doing the blog hop. That would be a great use for these mini-charm packs! Thank you Moda and all the wonderful designers for the great Blog Hop! I’m a bit new to the quilting world and the Hops…I some how missed these blocks and can’t seem to find them? I want to make this Friendship quilt but I’m missing…2,5,7,9,22,24 & 29! Can anyone help me find them? I want to make all the blocks that everyone provided, and put the sampler together with all those lovely charms. Thanks for sharing and hosting another wonderful blog hop! Thanks to all the designers for the terrific blocks!! Sure would love to play with the assortment of fabrics! I’d make quilts with some of it and use part to teach my grandchildren to sew. They all want to learn and that makes me very happy. march madness would become moda madness with a postage stamp quilt if I would win all of these little treasures. This has been a lot of fun. Thanks for a chance to win! I am a kid in a candy shop with fabrics and quilting –I want to try every sweet little thing. I will make a memory sampler to remember this toothsome adventure. Thanks for the sweet memories! I would share the charm packs to make quilts for our guilds charities! 9-patch, what could be better? Thanks for the fun blocks and all the give aways. Blessings on you all. I would make a scrappy quilt for my youngest grand daughter! I love those tiny charms! I would not want to be without my rotary cutter, thread, and needle. I would definitely use the mini charm pack to make a hexagon quilt. There are a lot of hexie quilts out in blogland. Making something out of those darling charm packs is definitely on my bucket list! I would make doll quilts for my granddaughters. A postage stamp quilt would be great! Thank you for the blog hop, it was such fun – a wonderful treat after a long day of work. I would use them for a small scrappy star quilt. I would use some for a quilt, and others as appliques on my kids’ clothes! They look so fun! So many delicious fabrics! I think I would try making 16 patch squares and set them on point alternating with solid squares. Love scrappy quilts and love Moda fabrics! Thanks for the opportunity! Haven’t started the friendship blocks yet, but will do so as soon as I finish a birthday quilt. Would love more fabric! I love having charm packs in assorted boxes & baskets, just sitting around adding color & inspiration. Eventually, many find their way into scrap quilts. I’d probably leave these cuties out for a while, to tantalize, tempt & tease. Someday, they’ll find a great home! Hi Lissa, Wow, with all of these minis I’d make a double irish chain quilt. These are the perfect size for swapping with friends in a 2.5″ scrap swap…no worries about size or quality of fabrics…. What would I do with them? You mean after I slowly clipped the paper band holding the small fabric pieces together and lovingly spread them out one by one, admiring each one’s charms and then arranged and rearranged the pieces to see how they played against one another? Whenever I find these little goodies in a shop, it’s so hard to take just one or two. These would go a long way in satisfying my urge to have them all! I love fabric especially whole collections of fabric so charms are perfect. I’m so happy if I can own just a little piece of a line of fabric. I love to make table runners, zippered bags and lap quilts. Thank you to all for sharing your patterns with us. I have never been a scrap quilt maker even though I love them, and I want to push into being able to be free in my use of fabrics and not have to be so “coordinated.” So I would love these tid-bits. I love scrap quilts and would like to make a scrappy clam shell quilt. Your mini charm squares would be perfect! I followed this blog hop and would use the fabric to start hand piecing blocks again. I would make a scrappy quilt. I would make quilts for the granchildren and donate a quilt or two to a needy group. Sharing is always the best! Thanks so much for this Friendship Quiltalong! It’s been so fun to travel through all of the Moda designer websites and add new blocks to my collection! The Moda family looks like they know how to have fun!! Wow, I would love to make the Moda Friendship Postage Stamp Quilt of 2013 with all of those minis! I love the mini charms and love making mini quilts. I would make quilts for me and as gifts for friends. Thanks for a wonderful blog hop, patterns and always the best fabric selection ever! Thanks for a chance to win some beautiful fabric. Baby quilts – table runners -I have been buying these up in bundles. Love them! I would sort by colors and plan a variety of quilty projects. Lots of eye candy! I’d love to make either a scrappy quilt or maybe a table runner and some zippered pouches. Thank you for a super giveaway and a chance to win. Thank you also for a great quilt along and patterns. Loved the friendship blog hop even if I never win! I love Moda fabrics and would make a mini 9 patch with those cute little morsels! I would invite some of my quilting friends to a day of fun. We would use these to make quilts for our guild’s outreach project. Thanks for the QAL. I would make a scrappy trip around the world or some other scrappy quilt. 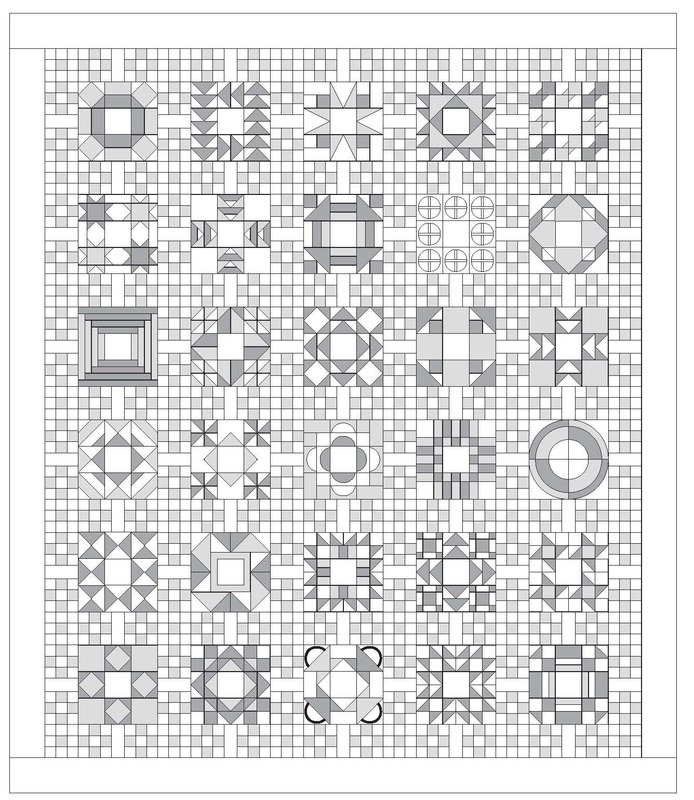 I would love to use all these little squares in a postage stamp quilt! I have finally learned the joy of pieced block quilts. They take time and dedication, but they are so much fun! I would love to try my hand with more blocks and this sampler would be the key to success. Thank you for this quilt along, I am so excited to finish these new blocks! Haven’t seen such a fun variety of blocks for a long time. The mini charms would be a delightful jump start for some of these gems. I think I’d make a nice lap quilt. Thanks for all the lovely block patterns! I’m saving up for a postage stamp quilt and this nice sampler would really make it nice and scrappy, not to mention saving me time cutting. I love these small bits of fabric, I would do a pixel style quilt!!!!! With all of those lovely little squares, I think I’d do some damage to a Around the World quilt. I would swoon if I won this give-away! I think it would be fun to put them all in a bag shake it up and sew them together as i pulled each one out. First of all I would share them with my friends!! Thank you for sharing such a fun blog hop! It was great. Love to use these in journal covers and table toppers. Hugs….. I would use them to help make the friendship quilt. This is the first time I’ve done anything like this. I love miss fabrics and designers! Thankyou. Charm packs are my favorite. I would make baby quilts and table runners. Thanks!